I am the target audience for Walt Disney World. I'm a Dad. Nevermind all the glitz and glamour, they just want me to keep moving from one line to the next while they siphon funds off of my credit cards. Why would anyone want to go to this place? Me? 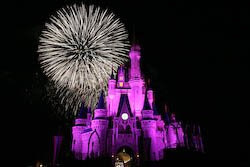 I went there because my daughter's school performed in the Magic Kingdom parade during Mardi Gras week. I denied my children's requests to go to WDW for more than a decade for all the reasons that I found to be true. Mostly, it's too long of a wait for too little reward. Well, I did have a little fun. Then again, that's the problem. I had a little fun. The good news is, it'll be 2 years before I have to go again! Just a word of advice, if you're in Tomorrowland, be sure to talk to Push. My Buzz Lightyear score improved dramatically. Today's major mishap was when I spilled my bottle of water. All over the desk, some work papers, the company keyboard, and so forth. I got it all cleaned up fairly well. The fun came when my monitor started turning itself on and off. Apparently, the water ran down the screen and into the controls. It took me half an hour to dry the flat screen monitor. I unplugged it and did a small bit of shaking. However, I got the most water out by wrapping my lips around the lower corner of the screen and sucking the water out of the crevices. I was surprised by how much got in there. The monitor seems to be okay, but for an hour afterwards, it would turn itself off and on. Again, glad my office is not the most visited.